TULSA- The 2011 Arena Football League regular season has been extended from 16 games to 18, Commissioner Jerry Kurz announced today. The league will consist of 19 teams and each will play 18 regular season games, with the option of two preseason games (one home and one away). The change was passed in an ownership vote last week during the league’s Board of Directors meeting in Phoenix, AZ. The AFL has officially grown from 15 teams in 2010 to 19 by adding teams in Philadelphia, Pittsburgh, San Jose and Kansas City. The Philadelphia Soul were the league champions in 2008 just prior to a dark year where the AFL made strong adjustments to its economic model. The league bounced back in 2010 with a very successful season in which the Spokane Shock beat the Tampa Bay Storm in Arena Bowl XXIII on August 20th. “The new 2011 franchises are in key markets with dynamic ownership,” added Kurz. 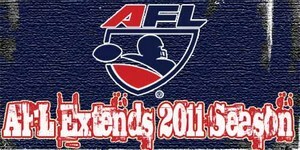 The 2011 season will be the longest in league history. In its 23 years of existence, teams have played as many as 16 games in a season. The league had observed a 16 game schedule since 2003.